Scientists in Germany said Thursday they had reached a milestone in a quest to derive energy from nuclear fusion, billed as a potentially limitless, safe and cheap source. Nuclear fusion entails fusing atoms together to generate energy—a process similar to that in the Sun—as opposed to nuclear fission, where atoms are split, which entails worries over safety and long-term waste. After spending a billion euros ($1.1 billion) and nine years' construction work, physicists working on a German project called the "stellarator" said they had briefly generated a super-heated helium plasma inside a vessel—a key point in the experimental process. "We're very satisfied," said Hans-Stephan Bosch at the Max Planck Institute for Plasma Physics in Greifswald. "Everything went according to plan." For all its promise, nuclear fusion has proven elusive and highly costly to achieve. The idea is to heat atoms to temperatures of more than 100 million degrees Celsius (180 million degrees Fahrenheit) so that their nuclei fuse. The fusion would take place in a special vacuum chamber where the atoms, in a hot ionised gas called a plasma, are held floating in place by superconducting magnets so that they do not touch the vessel's cold sides. 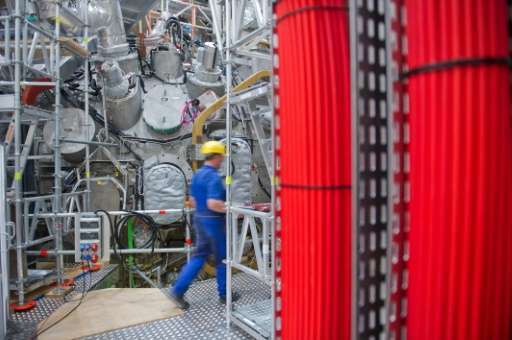 The German experiment, using a machine called Wendelstein 7-X, was aimed at seeing whether it was possible to heat helium atoms with a microwave laser and to briefly contain the plasma within the vessel. The first plasma in the 16-metre-wide (52-foot-wide) machine, from one milligram of helium gas heated by a 1.8-megawatt laser pulse, lasted one-tenth of a second and reached a temperature of around one million Celsius, the institute said in a press release. The team will next try to extend the duration of the plasma and to find out the best way of producing it. Next year, it hopes to switch over to hydrogen, the actual target of the study, as opposed to helium. Several countries are in the race to build a fusion reactor, including a multinational effort called the International Thermonuclear Experimental Reactor (ITER). Headquartered in southern France, ITER is building a doughnut-shaped containment vessel called a tokamak. But plagued by technical problems and cost issues, it has yet to carry out its first experiment almost a decade after the project began. Other far smaller experimental reactors are also being developed in the United States, but funding has been a problem. The Wendelstein 7-X will not produce energy. Instead it hopes to sustain a plasma for 30 minutes, deemed to be proof that its technology can operate continuously, whereas a tokamak can only run in pulses without auxiliary equipment. That is a tokamak on the picture, not a stellarator. "Wendelstein 7-X, the world's largest stellarator-type fusion device"
to heat helium atoms with a microwave laser and to briefly contain the plasma within the vessel. Here you can see the problems associated with trying to create fusion reactions. Firstly the ignition of the plasma and secondly the containment. Both of these are required for creating a star and both of these absolutely defy any notion that it will occur naturalistically , all by itself. There is no current scientific explanation for how the first stars achieved this miraculous condition of both ignition and containment all by themselves with no outside help. In fact the current cosmological model rests on the non-creation of stars. Stars should not exist in that model. And if you don't have stars in that model you don't have planets or galaxies either. The current model is bankrupt. Ah. You might head over to wikipedia and look up this cool thing called 'gravity'. By your post I'm pretty sure you've never heard of it. Read a bit up on it. Fascinating stuff. Does all the tricks you claim "can't possibly happen"
The "current model" conflicts with Freddy's fundamentalist religious beliefs, his comments have nothing to do with science. [The current model is bankrupt. Sure! It was Big GoobleWooble who created them accidentaly during his fight with Cruglampf The Magnificent. But plagued by technical problems and cost issues, it has yet to carry out its first experiment almost a decade after the project began. Other far smaller experimental reactors are also being developed in the United States, but funding has been a problem. This state of insufficient funding is rather disturbing and suspicious given the supposed threat of climate change,... especially given the historical example of the Manhattan Project achievement in remarkably short time with very difficult engineering problems, albeit perhaps not as severe as for fusion. I suspect that a successful fusion-reactor would be unwanted and direct competition to liberal-progressive-government regulation and social engineering, as a solution to climate change,... so therefore is not pursued with a sense of urgency which one would EXPECT given the AGW-alarmism propaganda. There is no current scientific explanation for how the first stars achieved this miraculous condition of both ignition and containment all by themselves with no outside help. In fact the current cosmological model rests on the non-creation of stars. Creationism disproves the supposed omnipotence of god; ...If observable physical phenomena can not also be scientifically understood by use of discoverable laws of physics, at least in principal, then the result is an imperfect universe, one with a defective "seam" existing between discoverable "laws of nature" and the "will of god",... not the state given a supposed omnipotent deity. Does your god need duct-tape? Miracles seem like metaphysical duct-tape, no? Feynman said "The first principle [of Science] is you must not fool yourself, and you are the easiest person to fool!" IF Wendelstein and/or ITER works the next step will be DEMO. And the one after that would be the first real powerplant (scheduled for some time between 2075 and 2100). 1) I never said AGW is propaganda and therefore not science. Stop inventing strawmen. I made reference to the concerted effort of promoting "AGW-Alarmism", not the published scientific papers. 2) I know all about the Manhattan project. I gave you no reason to think otherwise. The UN is promoting the notion of "last chance to save earth" wrt the current global summit. The analogy is spot on. That the Manhattan Project was a success despite during war, even strengthens my point, not weakens it. The only relevant point though was that it was a success. 3) The term "propaganda" merely means a concerted effort, possibly bias, to promote a political cause. It's doesn't imply necessarily that it is a false cause. If anything is to be done about AGW then it will of necessity involve politics, and therefore adults willing to engage in such discussions or debates. At the present rate of development, that 'may' be accurate,.... but as proposed above, a global Manhattan'esque Project for fusion (and other alternatives), would render such estimates obsoleted. Throwing money at it isn't going to make it go any faster. I see that in programming all the time. Mangers think by doubling the manpower they can halve the time to market - and are invariably surprised that doubling the people LENGTHENS the project timeline (because now the first batch of programmers are busy teaching the second batch and no one is working on the project). @ AA, I quoted and replied to statements from the above article referencing a funding deficiency. 2) The Manhattan Project demonstratably refutes any such presumed speed limit to technological progress as you seem to imply. A concerted effort with concentrated massive funding and talent, to try multiple designs simultaneously, would change the dynamic. Parallel processing is much faster than sequential. The point was that it's NOT being done even though the proposed cataclysm of climate change would seem to justify a Manhattan'esque Project more so than did the original. Alternatives to the $20 billion ITER and billion dollar Stellarator, more progress on much smaller budgets. You could find out something about potential motives, rather than suspect. I have read of four different approaches to fusion that are privately funded (and not cold fusion). I read that one of them, the Polywell, used to be funded by the US Navy, which had to withdraw when Congress ruled that ITER had sucked up so much money that no federal agency was allowed to fund any other approach to fusion. I have no idea whether that was a partisan effort, and if yes, which party restricted funding. Why don't you look it up? You may have noticed that Congress is dominated by people who claim global warming is not a problem. Why do you expect them to be motivated by preventing it? I have to disagree. carbonengineering machines need to scaled up massively and powered by either fusion or fission. How else are we going to fix climate change? We need to "manually" or forcibly bring the concentration of c02 down to 280 PPM. How you are again? I am still good and getting better. Lookee-loo at this one? He is even trying to make him self known in the Big Sleazy. Hoooyeei, I wonder if he will be doing a live show down in Jackson Square? I sure would like to see that one.